One thing I love about being a blogger is that I’ll occasionally be emailed something I wouldn’t have discovered otherwise. Like today. Next week Thursday (2nd of February) there will be a one-night performance of Festival of the Spoken Nerd. Why have I not heard of these guys before? Their show sounds like something right up my alley! 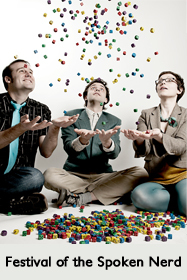 Stand-up mathematician Matt Parker, geek songstress Helen Arney, and Blue Peter’s resident science expert Steve Mould bring you Festival of the Spoken Nerd – a comedy night for the insatiably sci-curious. I’ll definitely be going next week, but I’ve also got two tickets to giveaway to one lucky reader! All you’ve got to do is leave a comment behind with who your favourite scientist is and why. You’ll also get a second entry if you’re following me on Twitter and tweet about this giveaway with the hashtag #missgeeky. The competition ends on January 30th after which I’ll randomly draw a winner. Of course, you’ll have to be based in London (or willing to travel to London) and be available on February 2nd.